It has been my experience that the question of our Authority on earth to wage spiritual warfare has been one of the biggest hangups for Christians. In fact, that is usually the first comment I get whenever I try to broach the topic. I will hear something like this: "Yes, the Apostles were able to cast out demons, and heal the sick, but all that ended with their deaths." This is pretty much the basis for a theological position called Cessationism. In strict theological terms, this refers, in Christianity, to a doctrine that says "spiritual gifts such as speaking in tongues, prophecy and healing ceased with the original twelve apostles". Notice that, in this definition, casting out demons is not even mentioned! Yet, the apostles did that work, too. So, in the intervening centuries, the Church has simply glossed over these facts and no longer even knows how to address it. And, now that Believers are awakening to the Truth of John 14:12, we are having to determine just how we regard this important part of our commission as workers in the Kingdom. (Please take the time to click on the link and see these important words from our Savior). With that counsel from our Lord, I have seen two distinct disciplines: Healing and Deliverance. In my opinion, Healing is using the authority and power from Jesus and the Holy Spirit to bring the healing of physical ailments to suffering Christians. The ministry of Deliverance finds us using our authority and Their power to help heal the spiritual wounds caused by the Enemy's attack on their flesh and soul. Very often, both of these disciplines work together because there is interaction between the spiritual and physical realms, and they affect both the spiritual and physical parts of us. In other words, Jesus asks us to work with Him and the Holy Spirit to help "set the captives free" from demonic oppression -- this is one of the "things He did", as mentioned in John 14:12, and to which He wishes us to do in even greater "outreach and extent". • In Genesis 28, Jacob was given a clear vision of interaction between the physical and spiritual realms. 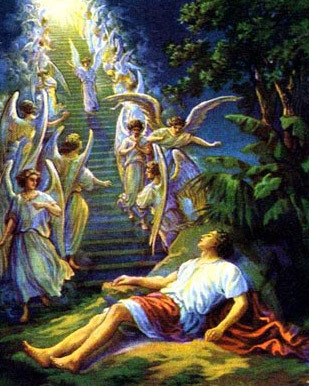 He dreamed that there was a ladder (stairway) placed on the earth, and the top of it reached [out of sight] toward heaven; and [he saw] the angels of God ascending and descending on it [going to and from heaven]. Jacob may not have fully understood what he was seeing in his dream, but he awoke with the realization that "Without any doubt the Lord is in this place, and I did not realize it." He knew that God had interacted with him, and that his physical world had been affected by the presence of God coming to him from the spiritual realm. • Moses certainly experienced the interaction of the spiritual with the physical, when he witnessed the burning bush and the voice of God in its midst. • The prophets in the Old Testament continually gave witness as intermediaries between the spiritual and physical worlds for people who could not see. False prophets spoke from their own minds and imaginations. God opened the eyes of His prophets so they could see into the spiritual realm and explain what they saw to the people. Ezekiel saw wheels moving in unison. Isaiah saw "the Lord, high and exalted seated on a throne; and the train of his robe filled the temple." He also saw the angels that surrounded that majestic throne. Elisha was able to assist his servant to see into the spiritual realm during a frightening episode when their city was surrounded by an army of horses and chariots. Elisha prayed, "Open his eyes, LORD, so that he may see." Then the LORD opened the servant's eyes, and he looked and saw the hills full of horses and chariots of fire all around Elisha (2 Kings 6:17). • But it wasn't only the Old Testament Prophets and Patriarchs who had knowledge and experience of this interaction. Stephen described what he saw in the spiritual realm, just as he was about to be stoned to death: "Look," he said, "I see heaven open and the Son of Man standing at the right hand of God" (Acts 7:54-56). Peter was released from prison by a spiritual intervention: "Suddenly an angel of the Lord appeared and a light shone in the cell. He struck Peter on the side and woke him up. "Quick, get up!" he said, and the chains fell off Peter's wrists" (Acts 12:7). Even Jesus, as fully man, encountered the spiritual realm while on earth. His baptism saw an intrusion of the Holy Spirit (in the form of a dove) from the spiritual realms, and the voice of God confirmed it. And I sometimes think we Christians forget that Jesus's ministry on earth always originated in the spiritual realm of Heaven. Jesus continually tells us that He only did what His Father had shown Him. How could that be, if He wasn't being shown things in the spiritual realm? And how can we dismiss what happened at the Transfiguration? Jesus parted the curtain between the physical and spiritual realms, so Peter and John could see that Moses and Elijah were living with God! 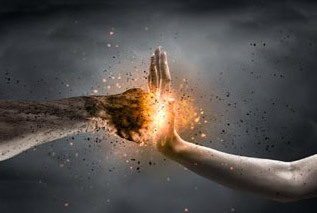 While all these examples show us that there were many good and glorifying experiences of interaction between the physical and spiritual realms, we must not ignore that the Enemy also has used this ability to interact with this world. When he tempted Jesus in the desert, he was able to show Him, in the spiritual dimensions, all the things of power and fame he could give Him, if Jesus would only bow down and worship him. And I find another interesting episode of interaction in the storm which arose when Jesus accompanied the apostles on their boat. The Greek translation says that "a great storm arose in the sea, an earthquake of the sea, its waters stirred to their depths". This suggests to me that the forces of darkness understood that Jesus was a risk to them. He was casting out demons, and they were powerless. He was healing the people they had inflicted with sickness. They knew that they had to deal with him, before He really got going. So they stirred up the sea and the wind in an effort to kill Him. That's why He rebuked the wind in the same way as He rebuked the evil spirits He was casting out in people. Can you see how both God and the devil -- both Good and Evil -- are able to interact with us through the overlapping dimensions of our physical world with the spiritual realm? There are many more examples in the Bible of such experiences, and if Christians throughout the centuries (after the inspired Word of God had ended) were to write down their testimonies of spiritual interactions, it would fill untold numbers of manuscripts! And guess what? It is still happening, whether we recognize it or not! So, it is imperative, if we are to serve our Lord as He purposed us to do, that we recognize and acknowledge that there is an invisible world just as real as this physical one, and it comprises the spiritual realm. It was created just as certainly as this rock we live on. These two realms overlap and the forces that aligned with Satan have access to our realm, but we are not powerless to withstand them! We need to understand that we have access to Jesus and the power of God -- the same power that He used in His ministry on earth to deal with those collaborators with the Enemy. And He has given us His permission to call upon those powers (it is His Name that activates them!) to resist the devil and his schemes to oppress us. That is our Authority! We desperately need to understand and get this concept! We need to know --- I mean really know, deep in our spirit -- that we are involved in a visible and invisible world that intersect, and there is a war going on, a cosmic conflict that has eternal implications. The souls of every man, woman, and child on this earth depends on us knowing that! And we need to know that the Enemy seeks to blind us, and convince us that this is not Scriptural. And he has been winning on that front for quite awhile now. The state of misery that so many Christians are living in is proof of that. So I can imagine that he is none too happy that more of us are waking up to the Biblical Truth that Spiritual Warfare is part of our commission as the Body of Christ. Our eternal Victory has been won on the Cross for those of us who call Jesus our Savior. But there are millions of lost souls who are in the cross hairs of the Enemy, and it is our calling to share our salvation story. With that, we can expect skirmishes, battles, and sometimes all-out war with the Adversary. And that means that we need to be more vigilant than ever to put on our full spiritual armor, as Paul advises in Ephesians 6. We need not be afraid or timid, or go searching for the fight. We just need to stand firm in the knowledge that there is power in the Name of Jesus, and we have access to it and the authority to use it. With that recognition comes the victories that will allow us to fulfill our purpose on earth. And that is what God and Jesus desire for us! 1 Corinthians 2:13 "We also speak of these things, not in words taught or supplied by human wisdom, but in those taught by the Spirit, combining and interpreting spiritual thoughts with spiritual words [for those being guided by the Holy Spirit]." Hallelujah! Powerful and anointed writing! Thank you! Victory in Jesus! Thank you! All the glory to the Powerful and Anointed One for inspiring me!